I've never been so health-conscious and label-conscious in my life, but having a baby will do that to you! I don't feed my baby girl any refined sugar, she eats mostly fruits and veggies, and some meat. I avoid feeding her foods that are processed, or that contain a lot of preservatives in them. I really wish I had the will power to eat as healthy as I feed my daughter, but I enjoy my sweets too much to do so! Ha ha. Still, we are making strides in this household to change what we can. Every little bit counts, right? So, when I found out about Tropi Treats, I was really excited to try them! 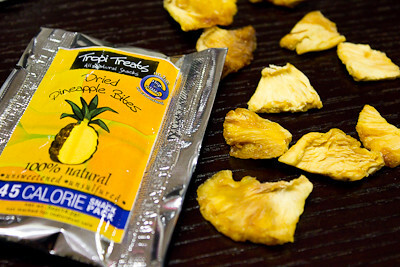 They are dried pineapple bites that have no added sugar or preservatives - it's just 100% pineapple! Despite having no added sugar, the bites are nice and sweet with a bit of tartness that you'd expect with pineapple. 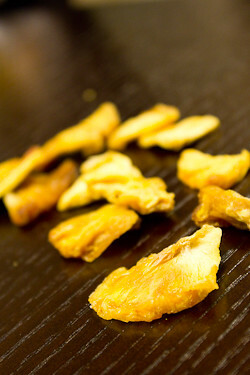 Some preservative free dried fruits can be tough and hard to chew but these are soft and chewy. My daughter loves these, and so do I! There is something about them that is so addictive! I really have trouble eating just a few pieces... so in that regard their small snack packs are perfect because I'm then forced to stop after a certain point. Want to try some Tropi Treats and see how great they are? The folks at Tropi Treats have generously agreed to send two lucky winners some free goodies! One winner will receive a 5 pack of the 4 oz bags, and the other winner will receive a 5 pack of the Snack Pack bags (each has six 0.5 oz snack packs). To enter to win, please leave a comment below, answering the following question: What ingredient(s) do you try to avoid when purchasing food? No duplicate comments - please note that comment moderation is enabled and it may take some time before your comment appears below. This giveaway is open to US and Canadian residents age 18 or older. Winners will be selected via random draw, and will be notified by e-mail. You will have 72 hours to get back to me, otherwise a new winner will be selected. Giveaway ends at midnight CDT on June 24th. Good luck! * Note - I was given free samples of this product to try, but this is not a paid/sponsored review. I try to avoid HFCS when purchasing food for my family! 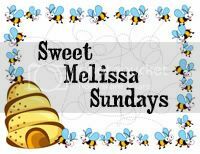 I just became a fan of Good Eats 'n' Sweet Treats on Facebook - Danielle N.
I try to avoid HFCS when shopping, as well as artificial sweeteners. i try my best to avoid anyting i cant pronounce. very hard, but we do our best! HFCS. It's hard to avoid, but I do my best! Although I am a sucker for certain processed foods, I try to steer clear of extremely high sodium laden foods. I was mortified when I found out how much sodium was in a cup-o-soup, and one pack of lunchables! Needless to say, I don't eat that stuff anymore! Good job feeding little A healthy stuff! Definitely the artificial sweeteners / (partially) hydrogenated oils. I definitely try to avoid HFCS, too! Thanks for the chance to win!!! Whoops, I got confused on how to get the second entry. So, since I all ready said I liked you on Facebook and said that I try to avoid foods with added sugars, I'll say that I also try to avoid foods that claim to be fat free or low carb (ie. diet foods) because they always contain lots of other ingredients, such as sucralose. Instead, I try to eat more fresh foods.